You probably did not know it then, but the gym classes you took during your school years influenced the person you became. If you had well-taught stimulating classes in the gymnasium, you learned valuable physical skills, set a pattern for lifelong fitness and grew socially from your experiences. For the same reasons, children still benefit from gym class at school. Physical education helps kids strengthen their coordination. A good gym class will provide a variety of activities that increase coordination, such as ball throwing and catching, swinging a bat, aiming a bow and arrow, and maneuvering a racket. Flexibility comes into play with gymnastic activities such as splits, vaults, backbends and walkovers. Such physical skills will help children in athletic pursuits, dance and in everyday movement. According to the National Association for Sport and Physical Education, the development of physical skills provided by physical education increases the self-esteem of individuals. The physical exertion involved in gym class results in endorphin production in the brain. Endorphins are the "feel good" hormones that improve mood and outlook. Children who engage in robust gym classes benefit from the release of endorphins. The physical activity becomes fun. The endorphins' effects allow kids to go to their next classes feeling cheerful, relaxed and ready to focus on learning new ideas. 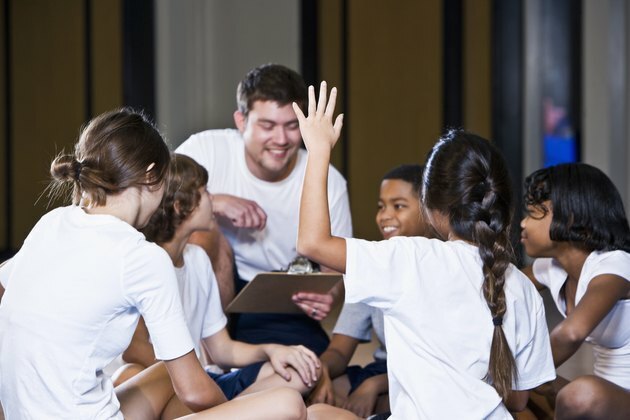 The social aspect of gym class should not be overlooked. Physical education class is often the only time of day in which kids can talk, laugh and play with one another without breaking school rules. The atmosphere is also one in which children can learn important social cues that will help them interact with others successfully. Children develop specific social skills such as teamwork, good sportsmanship, and learning and following rules. Skirmishes between children do occur while playing competitive games, but a good teacher can guide them in learning to resolve these natural disputes in a positive manner. What Are the Benefits of Positive Reinforcement in Kids?